« Vicar’s wife confesses a twelve year infatuation with a younger man. One of the main problems I had to overcoming along the road to publication was that I’m dyslexic. I’m in good company as it’s estimated that between 6 -10 % of the population have the condition. There are many well know personalities such as Richard Branson, Whoopi Goldburg and the bestselling author Katie Fforde who are dyslexic. It’s not a problem and there is plenty of evidence that people with the condition are very creative and out-of-the-box lateral thinkers. And I say blessed because I think we are and I firmly believe I would be the writer I am without my dyslexia. For those of you who may not know too much about the condition, dyslexia manifests itself on a spectrum of different way from problems with spellings through to difficulty reading. It can’t be cures and has nothing to do with intelligence. Of course in this day and age it shouldn’t be a problem as schools are supposed to look out for children who might display symptoms and support them. There are a range of aids and assistance to help them cope but when I was at school dyslexia wasn’t understood or even recognised. 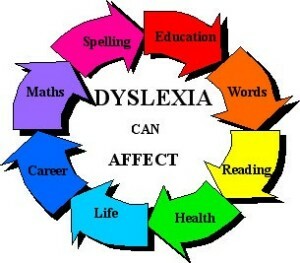 My story of dyslexia started in junior school that my problem with spelling first raised its head. I remember the headmaster telling my parents that I had word blindness – the original; name for dyslexia – and advised I be encouraged to do crosswords to improve my spelling. It didn’t and so I soon gave up. Thankfully, my dyslexia didn’t encroach on my reading and did very well at secondary school. Despite my dyslexia remained in the top stream, even in English, but there was the problem. Although my comprehension and composition scored high marks my spelling always let me down. By the time I got to my 4th year English lessons were nothing short of torture. We’d have the list of twenty spelling given out on Monday morning in preparation for the Friday morning test and I would diligently try to learn them. On Friday we did the test and then stood up. The teacher asked who’d got twenty and they sat down and then he would move onto nineteen and eighteen and so on until the only pupil standing was me. Although I talk quite openly about this now you can imagine how I felt as a fourteen year old. Much to my surprise and probably more so to my English teacher, I somehow managed to pass my GCE English but then opted out of the subject to concentrate on more enjoyable topics such as history, geography and sociology. I left school with a handful of GCEs and a couple of A levels but went straight into the fashion trade as the thought of being a secretary or bank clerk, where I had to use English every day, was totally out of the question. I did various jobs got married and had a family then I decided to retrain as a nurse. I sailed through my training and took a post as a community nurse. I started my district nurse degree in 1994 and only then was my dyslexia finally recognised. I also discovered that I didn’t have the ability to sound out words so I’d actually learnt to read by memorising the sound of each individual word. I moved up in my nursing career until in the NHS until I was sent the stress management course I told, you about in the earlier blog about started me writing. Once I realised being a published author was what I wanted to do I had the old nightmare of 4th year English all over again. Although my stories were page-turners my manuscripts were littered with miss- spelt words and incorrect grammar. I knew in such a competitive market no agent or editor would waste their time on my submissions. If I was to have a hope in hell’s chance of getting off the slush pile I had to find a way of compensating for my dyslexia. I had to send each book and every letter out for professional copy-editing and this cost a great deal of money. We had three teenage children at home at this time so as you can imagine finance were tight so on top of my day job teaching at the University every other Friday I did a night shift in a local nursing home to pay for the copy editing. Finally, this paid off when No Cure for Love won the2006 Harry Bowling Prize. Fetch Nurse Connie is my ninth novel thanks to the unwavering support of my lovely agent Laura Longrigg, who understands totally. I’m also blessed in my editors at Orion, Sara O’Keeffe initially and now Laura Gerrard, both of who have also been unbelievably supportive over the past ten years. Although after writing a million words plus and my spelling and grammar are much improved, my dyslexia is still a problem for things like blog and press releases. This is where my darling Hero-at-Home steps in. He reads all my stuff for missing or wrong words and Ss and ed missed at the ends. It might not seem fair that if you have dyslexia you have to jump through so many hoops but the truth of the matter is unlike school and university there are no allowances made for dyslexic authors trying to get the first foot on the publishing ladder. My advice to any budding authors with dyslexia reading this post is you’ll have to do what it take to get you manuscript up to publishing house standards and stick at it. And remember you’re the gifted ones.